Photo adapted from “Robot” by Börkur Sigurbjörnsson (Flickr, Creative Commons). Recently, I decided I wanted to automate some of the inquiries I get on my web site. As I’m a web developer, most people come to my site with one or more of the same few goals. They either want (1) a new web site, (2) someone to fix or redesign an existing site, or (3) someone to do marketing, SEO, or other consulting related to their site. Looking at the stats, I figured it should be possible to apply some A.I. 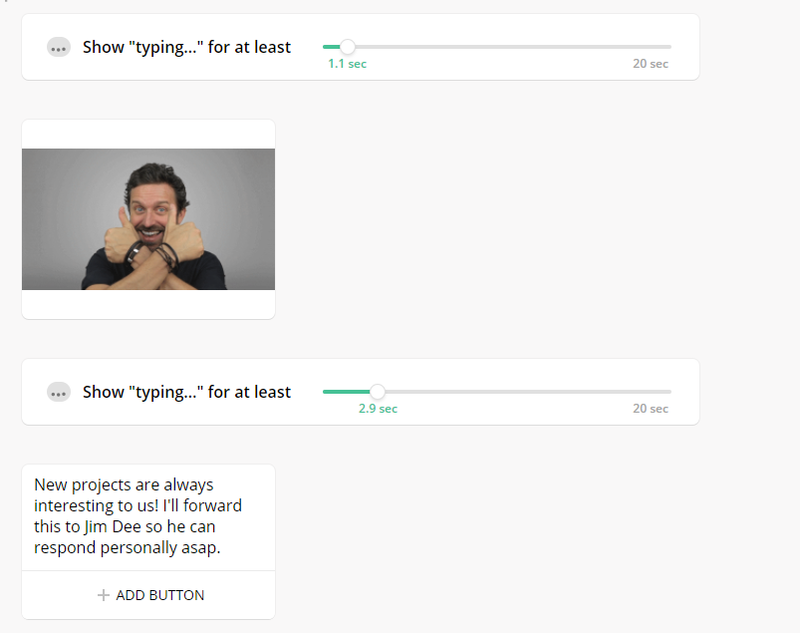 to that kind of thing and maybe automate some responses to sort of pre-engage visitors in a smart way. But, is this sort of thing easy or doable? As it turns out, yes, it’s both. There’s a phenomenal site called ChatFuel that facilitates this entire process. 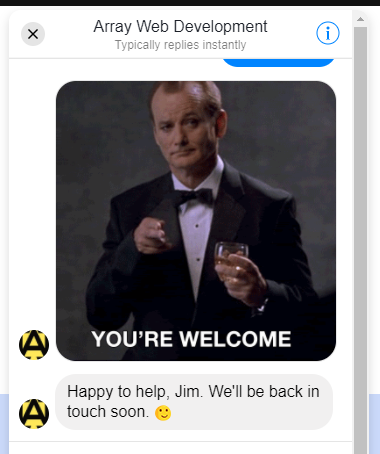 The site helps developers (and even some more tech-savvy site owners) build rather advanced Facebook chat bots. Right away, notice that my corporate logo is on the top-right of the chat bubble. I didn’t have to program that in; the bot knew what to grab for that. Notice also that the site addresses me by name. 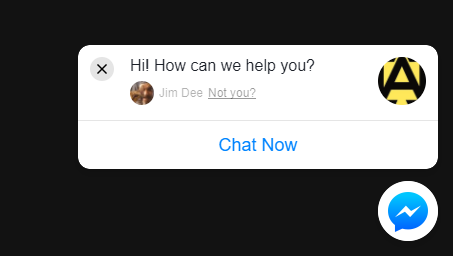 It has my FB photo and says “Jim Dee” next to it. Again, I didn’t have to do a thing to get this… My machine is logged into FB, similarly to how yours may well also be. If yours is, and you go to my site, it will similarly greet you with your photo and name. This is critical psychologically because the message to the user is that we’re already connected in some way — and that, in some small way, helps establish trust. Powerful stuff! And, we’re just getting started! So, again, it’s greeting me by name: “Hi, Jim-”. Pretty neat. From here, let’s pretend I’m interested in a new site. So, I’ll write: “I’m writing because I need a new web site.” This is where it starts to get more interesting. So, in this example, it more or less gives the impression that the person typing from my company is probably an assistant — which it is; it’s just a virtual one rather than an actual human one. Now, you can go completely nuts with this tech. It’s meant to be accessible to non-programmers, and certainly is. But, it really does help if you’ve got some background in how programmatic logic flows. I’ve barely scratched the surface here of what’s possible, but my bot already handles all of the major areas I wanted it to, plus a few others. It concludes with the above, plus a final link to our website. Now, I know what you might be thinking: Why include a link to your site when they may well be a web site user on your homepage while they’re chatting? Good question! 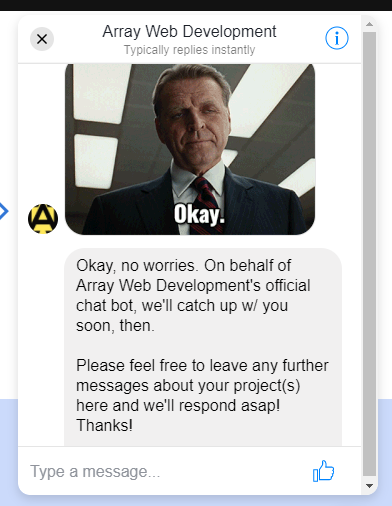 I did that because of another huge benefit of FB chatbots. You see, once you’re chatting with someone (or, in this case, my *page* is chatting with them), you’re connected on FB messenger. That chat record will now be in my chat logs and the user’s, forever (or until they delete it). So, getting a link in there is probably a good idea! 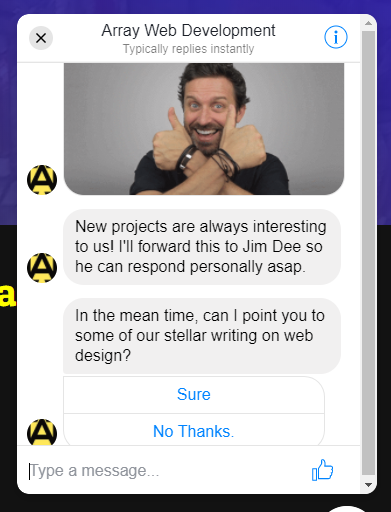 Also, as you’re now connected, you can easily, as the site owner (the FB user) directly follow up with your prospects. Ever take a look at response rates of FB chat vs. email? It’s insanely higher. As I mentioned, you can build out your bots (or I can do it for you) to almost any degree of complexity. And, yes, the bots can be integrated with many outside services and sites, which advanced users might want to do. Jim Dee heads up Array Web Development, LLC in Portland, OR. He’s the editor of “Web Designer | Web Developer” magazine and a contributor to many online publications. 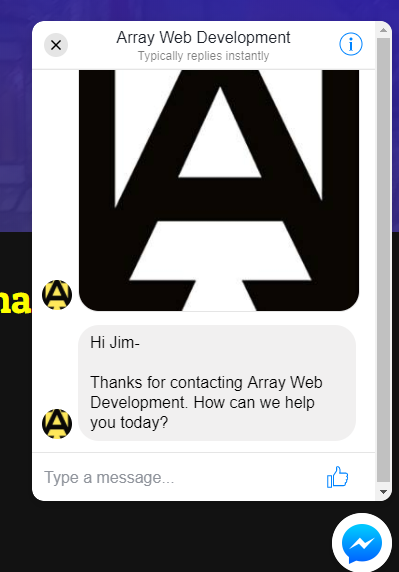 You can reach him at: Jim [at] ArrayWebDevelopment.com.